In the 37th over of New Zealand's innings in 5th ODI, Dhoni's presence of mind came to the fore when he ran out James Neesham during their 253-run chase. Hailed for his lightning sharp reflexes and unmatched knowledge of gentlemen’s game – MS Dhoni is a legend by a distance when it comes to white-ball cricket. The world’s best finisher – Dhoni is not only a master in scripting memorable chases but also an equally daunting force when it comes to donning those gloves behind the stumps. A glimpse of Dhoni’s masterclass was once again on display during the fifth and final One-day international (ODI) between India and New Zealand in Wellington. Back into the playing XI after a hamstring injury, the former India skipper failed to make any substantial contribution with the bat. 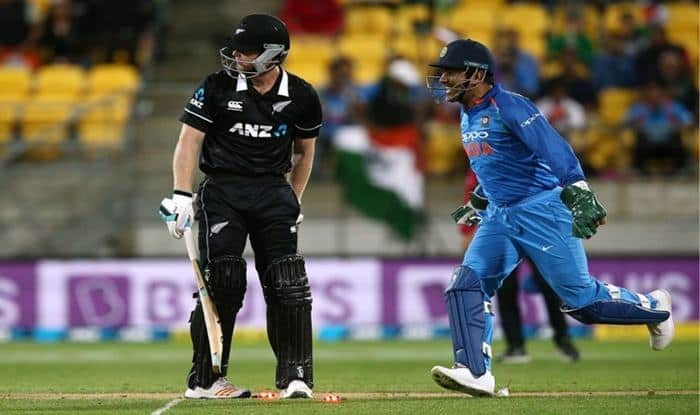 However, Dhoni more than made up for the missed opportunity with a match-changing moment during Kiwi innings when he affected an incredible run-out of dangerous James Neesham. Neesham missed a flighted ball bowled by Kedar Jadhav and it hit him on the back pad. All the Indian players appealed but umpire said not out as the impact was outside off. The ball then deflected behind the stumps and Neesham came out of the crease having no idea where the ball was. Dhoni showed great presence of mind and reacted quickly to the situation to take a direct throw at the stumps. Umpire then referred it to the third umpire and replay showed that Neesham was well short of the crease. India missed the services of Dhoni in the fourth ODI in Hamilton when the visitors’ batting unit imploded under swing-friendly conditions. However, Team India went on to win the fifth ODI by 35 runs to complete the 4-1 series victory over Black Caps. It was India’s 9th bilateral ODI series victory since the 2017 ICC Champions Trophy. India and New Zealand will now play a three-match T20I series, starting from February 6.